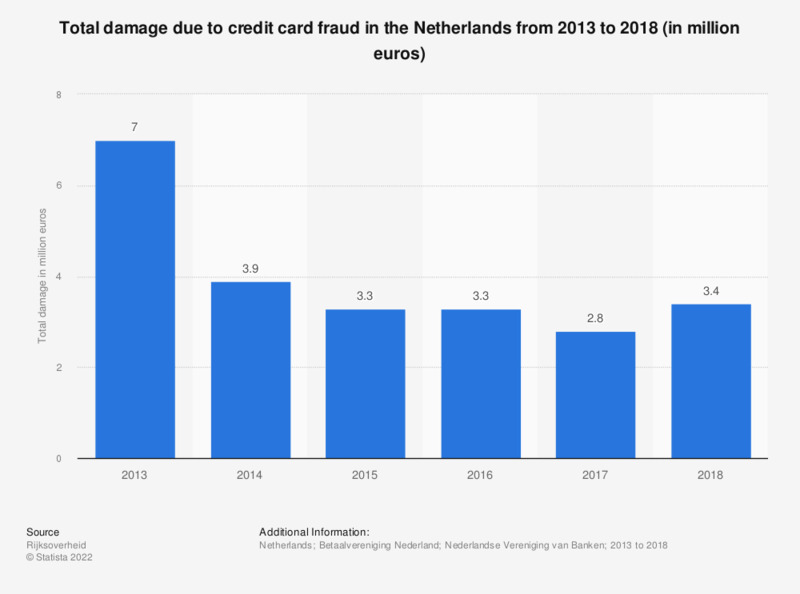 This statistic shows the total damage due to credit card fraud in the Netherlands from 2013 to 2017 (in million euros). In 2017, credit card fraud in the Netherlands led to a total damage of approximately 2.8 million euros. Like in other European countries, credit and debit cards are a popular form of digital payment methods for either physical purchases in brick-and-mortar-stores or for online purchases. Consumers from the Benelux countries are familiar with credit cards and possess them. Ever since the launch of digital payments, the payments industry tried to create a secure environment for financial transactions. Debit and credit card fraud comes in different kinds, of which phishing, skimming and identity theft are the most common ones. It is predicted that technology as EMV (Europay MasterCard Visa, a credit card technology that uses computer chips to authenticate chip-card transactions) should make some payments safer, but fraud could still remain a problem for the near future. During a survey in 2015, approximately one third of Dutch respondents indicated they were fairly concerned about surveillance via payment cards. How did your bank respond when you reported the (credit or debit card) fraud to them? How many times have you, a family member or friend been a victim of credit or debit card fraud in the past year?